Israel Adesanya might just be the next big star that Ultimate Fighting Championship (UFC) is looking for. The 28-year-old former professional kickboxer made good on his Octagon arrival earlier this month when he flattened middleweight Rob Wilkinson via second-round TKO at UFC 221 in Perth, Australia. It was a spectacular finish for “Last Stylebender,” especially considering the hype that surrounded his UFC debut. Now that Adesanya is in place to make a name for himself within the biggest mixed martial arts (MMA) promotion in the world, he’s making it known that he’s willing to fight any middleweight UFC puts in front of him. “I’ll fight anyone, anyone in the world,” Adesanya told MMAjunkie following his victory over Wilkinson at UFC 221. “I’ve never really had my fights cherry-picked. A lot of these guys will get into the UFC or even combat sports, like boxing or kickboxing, they get their fights cherry-picked. Not me. All my fights were fighting the best people from different parts of the planet. While Adesanya possesses promising skill inside of the cage, evident by his 12-0 professional MMA record and 50-5 record as a pro kickboxer, the Nigerian native is just as effective on the microphone. He’s confident, charismatic, and capable of turning out some pretty memorable sound bites (like this UFC 221 post-fight interview). It’s something that’s going to fuel Adesanya’s promotional ascension heading into the second half of 2018. 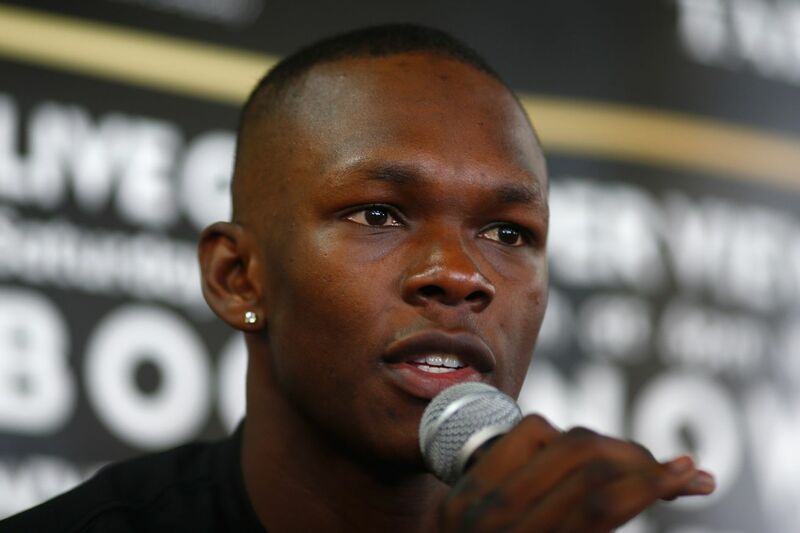 “No one’s really calling me out or saying anything yet,” Adesanya said. “I know these boys, they’re just treating me like the Dark Lord – he who shall not be named. They feel like if they say my name, they might get the power. Or maybe they’re scared. I don’t really care. Adesanya has a lot of work to do if he’s ever going to climb the 185-pound ladder and threaten for UFC gold, but the “Last Stylebender” is confident that he’s as good as advertised. “I’ve been there for a long time, you guys are just late to the party,” Adesanya said. While rising UFC middleweight prospect Paulo Borrachinha has looked completely unstoppable throughout his entire professional career, the undefeated 26-year-old Brazilian will be taking a huge step up in competition tonight (Sat., Nov. 4, 2017) at UFC 217 live on pay-per-view (PPV) from inside Madison Square Garden in New York City, when he takes on former UFC welterweight champion Johny Hendricks. Even though Hendricks has posted a pedestrian 1-4 record since the beginning of 2016, the 34-year-old veteran represents the biggest test to date for Borrachinha. Fortunately for the Brazilian, his confidence is riding high entering his PPV showdown with “Big Rigg” in NYC. “I think I’m well trained for what [Hendricks] is going to try to do,” Borrachinha said in a recent interview with FloCombat. “I think he’s going to want to take the fight to the mat or stay on the fence to clinch. I came to the U.S. three weeks early to train for this. He’ll not be able to take me down, and if it does end up on the ground, I’ll get up fast. While Borrachinha has never encountered a wrestler as distinguished and talented as Hendricks, the Brazilian is one of the bigger and stronger names on the UFC’s middleweight roster. It’s going to be very difficult for Hendricks to drag the rising youngster to the canvas, let alone hold him down. 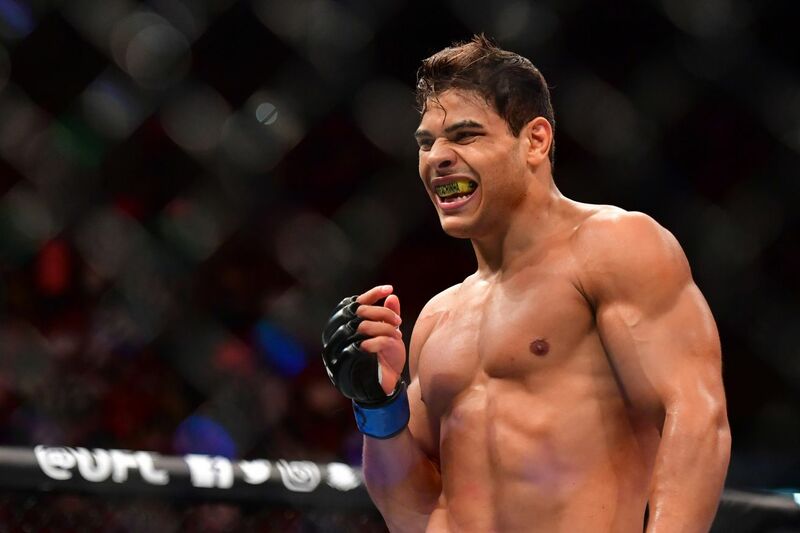 If everything goes as planned and Borrachinha is able to keep the fight standing, he believes a memorable knockout finish of a former UFC champion will further reveal his growing star potential at 185 pounds. Considering the UFC’s middleweight division is home to a slew of top contenders entering the latter part of their careers, a fresh threat like Borrachinha would be welcomed with open arms. But before the Brazilian gets ahead of himself he’s going to have to deal with a Johny Hendricks fighting for relevancy this weekend at UFC 217. MMAmania.com will deliver LIVE round-by-round, blow-by-blow coverage of the entire UFC 217 fight card, starting with the Fight Pass “Prelims” matches online, which are scheduled to begin at 7:00 p.m. ET, then the remaining undercard balance on FOX Sports 1 at 8 p.m. ET, before the PPV main card start time at 10 p.m. ET. Luke Rockhold has lost just once in the last four years, and yet he’s nowhere near a title shot. That’s because the man who beat him 11 months ago, Michael Bisping, is waiting for his next challenge in the form of Georges St-Pierre, and that fight isn’t expected to take place until sometime after October. Needless to say, the former champion Rockhold — who lost the title to Bisping at UFC 199 last June — doesn’t know his current bearings, especially with Yoel Romero sitting idly as the No. 1 contender and Robert Whittaker fast-emerging behind him. And it’s frustrating for Rockhold, who appeared on The MMA Hour on Monday a bewildered and deflated fighter who finds himself at wit’s end. Rockhold has been recovering from an injury and splitting time between his usual gym in California, AKA, and training with Henri Hooft in Florida. At 32 years old, Rockhold is still in his prime, yet he can’t seem to get back on track towards a title that has gone on a detour since he lost it. Bisping defended the middleweight title against Dan Henderson at 204 last October, and looks poised to go a year between defenses as he awaits GSP’s timetable for a return. It’s to the point that Rockhold is fed up with the situation, and is ready to sit out for as long as needed until something is presented to him that feels like a “path” back to the title. He went so far as to say that his fellow contenders in the middleweight division should essentially stand their ground and refuse to fight, too, until some amendments are made. Asked if he meant like a middleweight strike, Rockhold smiled. Rockhold said that the UFC offered him a fight with Mousasi in July, but right now that fight doesn’t necessarily interest him. Why? Because Mousasi, who is coming off a controversial victory over Chris Weidman at UFC 210 in Buffalo, doesn’t get him any closer to a title shot. Whereas a bout with Whittaker, who knocked out perennial contender Ronaldo “Jacare” Souza in April, moves him towards something. Sitting pat in a weight class that’s rife with dissension, Rockhold said it’s up to the UFC to figure things out. “The ball’s definitely in their court, and I think they know that,” he said. “I think everyone’s not very happy in the situation we’re in right now. I’m sure Yoel’s payment isn’t going to hold him off too long. Before losing to Bisping in what was a short notice fight at UFC 199, Rockhold had won five straight bouts against top middleweights, with all of them ending in finishes. Most recently he defeated Weidman to win the title at UFC 194 in Dec. 2015, dealing the Long Island native his first professional loss. Before then he took out former light heavyweight champion Lyoto Machida and, of course, Bisping. Nearly a year after losing his title, Rockhold sounded like a man who was fed up with how things were playing out in the UFC. The one thing that Rockhold reiterated on numerous occasions is that he doesn’t want to take a fight that doesn’t have obvious upward movement. He said that in the new UFC, under the new ownership of WME-IMG, the meritocracy that was in place is now being torn to shreds. And if that’s the case, he said he would be open to pursuing fights outside the promotion. “I go put on a performance and I beat one of the best guys in the world, I mean, there’s no path to anything, so what’s the f*cking point?” he said. “There’s no point in staying in this division, or f*ck, I mean in this company. If it’s just money fights, I’ll go do that somewhere else. Rockhold’s disdain for the way the Bisping situation is playing out, with all the division’s top contenders in limbo while waiting on St-Pierre to be ready, remains a point of major contention. Reminded that it could possibly be November before the fight happens, in order for it to occur at Madison Square Garden, Rockhold sighed. Rafael Carvalho remains unbeaten under the Bellator banner following his second middleweight title defense at Bellator 176 in Torino, Italy on Saturday, and he’s excited about the possibility of new blood coming to the division in the future. Carvalho improved to 5-0 in Bellator with a fourth-round knockout victory over Melvin Manhoef. Afterward, he admitted he didn’t expect the veteran striker to last that long. Prior to the bout, Carvalho told MMA Fighting he didn’t pay attention to the criticism surrounding his lackluster and controversial decision win over Manhoef last May. But with Bellator 176 now in the books, the Brazilian admitted he was bothered by it. “Yes, yes. Of course,” Carvalho said. “I couldn’t show it, but deep inside it was bothering me because people were only criticizing me because of that first fight. I was the target. I used that as fuel for this fight. I think that now they will forget that fight and be quiet. Carvalho now holds a 14-1 MMA record with 11 knockout finishes. Bellator has yet to announce who’s next in line for the 185-pound gold, but the possibility of the promotion’s president Scott Coker going after top UFC middleweight Gegard Mousasi, who became a free agent after his win over Chris Weidman, and Ronaldo Souza, who will fight the last bout in his UFC contract the Saturday against Robert Whittaker, is music to Carvalho’s ears. “It would be good,” said the Bellator champion. “It would be good for the promotion, would show its strength, that it’s growing. There are a lot of athletes moving over to Bellator, and they wouldn’t be the first nor the last. There are athletes going the opposite way too, from Bellator to the UFC, and that shows there’s a balance between both organizations. The 26th season of “The Ultimate Fighter” looks like it could feature Octagon hopefuls from a trio of weight classes. NEW YORK — At the UFC 208 open workouts, Derek Brunson talked about his upcoming fight against Anderson Silva, the nerves involved with fighting a legend, how the Silva of today compares to the Silva who was UFC middleweight champion, what a win could mean for his future, and much more. The post Michael Bisping Is Making the Middleweights Interesting Again appeared first on Caged Insider.